These cool little guys are great for a treat. 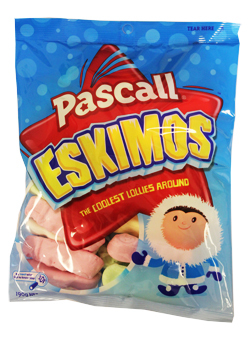 A marshmallow type confectionary in the shape of Eskimos, coming in four different colours they are great fun for the kids. Why not try the kiwi classic, the lolly cake. It is very simple to make and great for parties. Melt butter and condensed milk in a pan. Crush malt biscuits and cut Pascall Eskimos in to small pieces. Sugar, Glucose (From Wheat and Corn), Invert Sugar, Gelatine, Colours (Spirulina, E100, E120), Flavours. Have converted my UK born kids to the good old lolly cake, what a hit!